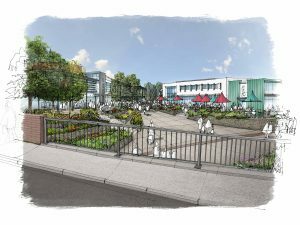 Taunton Deane Borough Council (TDBC) and St. Modwen have been development partners for the Firepool site for the past nine years. Following a review it has now been decided to end the partnership. During the partnership, St. Modwen has worked tirelessly with TDBC, investing St. Modwen expertise and resource to bring forward delivery of the development to reflect the joint aspirations for this important town centre site. In view of ongoing major changes in external market conditions, the Council respects St. Modwen’s decision to focus its business on commercial/industrial and residential developments, rather than the mixed use, town centre regeneration scheme proposed for Firepool. It is important to stress what has been achieved by the partnership over recent years: this has included the Viridor HQ offices employing hundreds of staff, 49 new homes with high quality public space next to the River Tone, as well as securing outline planning consent on a very difficult site that will underpin future delivery. The resolution to grant outline planning consent in March 2018 provides an important foundation for any future development, incorporating issues such as quality of design across the site, frontage to the river and other high profile areas, and traffic and transport management. It also provides the basis for continued discussion with a number of interested occupiers and flexibility to consider other potential uses within the overall mix. The Council will be taking these discussions forward and will also listen and consider views from the community in shaping and delivering this key town centre scheme. “We remain fully committed to developing a high quality mixed use regeneration scheme for Firepool, providing a fantastic riverside environment and creating strong links between the town centre and the railway station”, said Cllr John Williams, Leader of the Council. Cllr Williams added: “Taunton’s wider regeneration and our focus on growing our Garden Town is already under way. In the town centre, the Coal Orchard site has received detailed planning consent to be transformed into a thriving mixed use new place on the river. The enhancement of Taunton Railway Station – creating a new south facing gateway to the town – will begin in 2019, complementing the introduction of modern, more frequent and faster trains connecting Taunton to London and other major towns and cities”. We have attempted to ensure that the Taunton.uk.com website is accessible to all. As well as following web development guidelines we have also provided additional functionality which can be accessed from the bottom left corner of the screen at all times. Please contact us to report any issues that you may have in accessing this website.